Mr. Winston Hay was born in Retreat, St. Mary, on September 5, 1933 and had his early education at Kingston College. He is a graduate of the University of Toronto where he studied Mechanical Engineering. His professional experience is primarily in the electric power industry. He has worked in that field in several countries, including Canada, Switzerland and Jamaica. During the period 1973 - 1981 Mr. Hay served as Managing Director of the Jamaica Public Service Company. He also worked as an Independent Power-Sector Consultant in the Caribbean from 1981 to 1986 where he was engaged primarily by the World Bank. In 1986 he was appointed a staff member of The World Bank, initially as Power Engineer and in 1987 was elevated to Principal Power Engineer. Having attained retirement age in 1995, Mr. Hay was retained by The World Bank as an Engineer Consultant. 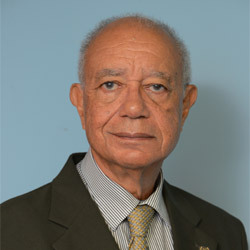 Mr. Hay returned to Jamaica in 1996, on being appointed the first Director General of the Office of Utilities Regulation, a position which he held for six (6) years. He was appointed a member of the Financial Services Appeal Tribunal from its inception in 2001 and remains a member. He has served as a Justice of the Peace in the Parish of Kingston since 1975. Mr. Hay is married to Edda, a union which produced two daughters and a son. He is an Anglican.